Discussion in 'Code Snippets' started by Erel, May 9, 2018. 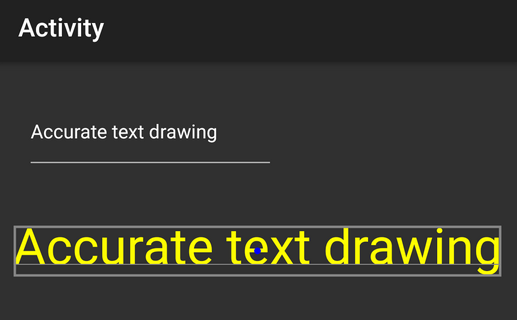 XUI v1.60 includes a new method named B4XCanvas.MeasureText. This method accurately measures single line strings. It returns a B4XRect object with the width and height of the measured string. The Top field returns the highest point relative to the baseline. Note that in B4i there was a small change in the way the offsets are set internally in B4XCanvas.DrawText. Multiverse app, mshafiee110, Johan Schoeman and 31 others like this. Then you have been too slow. Thank you Erel! You never stop bringing something new. 2) in the meantime, maybe you've done other things too. Since two years I'm good with using the known methods. What makes wonder is the object's/method's name "B4XCanvas.MeasureText". Here a canvas is used to measure a text. I would have done it (if I was Google) like "Textobject.NeededWidth" or "Textobject.NeededHeight" depending on the content and given textsize or even vice versa "Textobject.MaxTextsizeToFit" when you set the height and width. Strange that Google did not implement such a basic thing. We need a "REALLY Like" button. Johan Hormaza and klaus like this. Since two years I'm good with using the known methods. Note that it is not possible to accurately draw a border around text, like done in this example, with the standard Canvas.MeasureStringHeight method as it only returns the total height and lacks the height above baseline. What makes wonder is the object's/method's name "B4XCanvas.MeasureText". This is a good point. In B4J and B4i you can call this method without initializing the B4XCanvas object as the internal canvas features are not needed. In B4A you do need to initialize it however you can create a 1x1 pixel canvas and use it for all measurements. KMatle and Johan Hormaza like this. I started to update an App after 2 years. Actually was really easy to draw Accurate text with AcceleratedSurface, but now I want limit the use of Libs to make the iOS version. I was about to drop XUI for the lack of text measurement. Are you also going to add DrawRoundRect ? 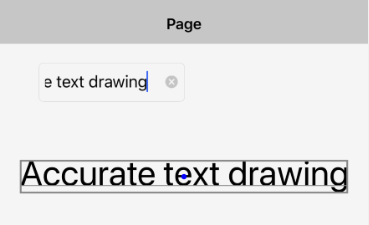 Are you also going to add DrawRoundRect ? Already possible. Start a new thread and I'll show you how. Myr0n and Johan Hormaza like this.